Suncreek's annual Christmas Family Connection will take place on December 8th this year, and everyone is invited to participate in this much loved Christmas outreach ministry. 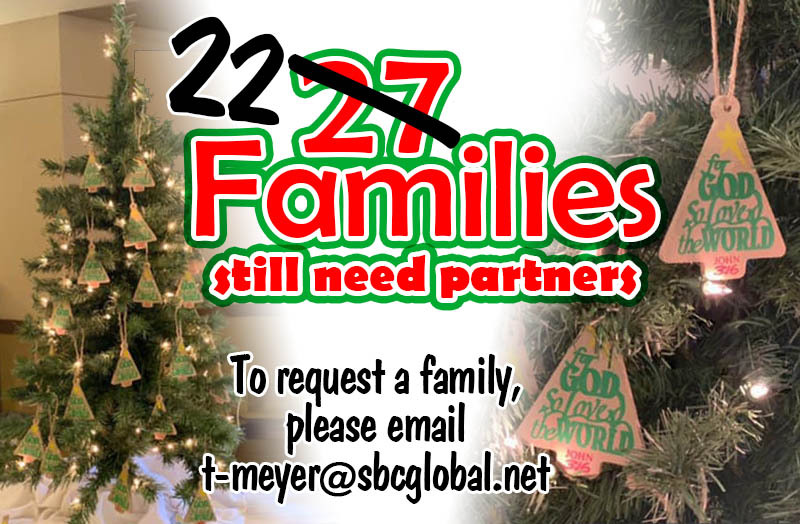 When you are partnered with a family, you will be given a list of items each family member needs for Christmas. The families at Trinity River Mission have performed numerous service hours in order to participate in this ministry. If you are unable to take on a complete family by yourself we can help partner you with another Suncreek church member to do it together. We also take monetary donations so the mission committee can purchase items for the families that do not have a partner. This is an amazing ministry that will bring the true meaning of Christmas into your family and busy lives. Saturday, December 8th, we have our Christmas Family Connection Celebration! This is a family event, which means if you have little ones please bring them. They are welcomed and the joy of Christmas that they bring with them is so wonderful! We will have a "check in" for the Suncreek families this year in hopes that we can easily match up who has arrived to get things working a little smoother. There may be some waiting, but we will definitely get you all together. We are encouraging everyone who is able to attend on Saturday to please come. The families really like being able to thank you in person and it is a wonderful experience to know the family that is receiving the gifts from you. Individuals from Help Portraits are going to take the TRM family pictures for free this year again for the TRM families. This usually is the only time they get a family picture done of their families. If you have a small camera that you would like to bring, we are happy to take group pictures for you when you want. for more information on how to partner with a family to provide toys, clothing food and more for a very deserving family in West Dallas. Trinity River Mission is a volunteer-based community learning center that promotes literacy, encourages academic success and develops effective life skills among disadvantaged youth in West Dallas, in the belief that education connects us to life’s possibilities. Trinity River Mission (hereafter “TRM”) is a 501(c)(3) volunteer-based community learning center serving the intergenerational education needs of children, youth, and families in West Dallas. TRM began in the early 1960s as an outreach ministry of Lovers Lane United Methodist Church to help in the relocation of Native Americans from Arizona, New Mexico, and Oklahoma. In 1988, TRM became an independent 501(c)(3) organization. Since 1988, TRM’s focus has been to promote literacy, augment academic skills, and develop educational success among children, youth, and families, with the understanding that language proficiency and educational achievement opens doors to satisfying jobs and productive futures. TRM services the needs of all children without regard to race or ethnicity. At present, however, TRM’s program participants are overwhelmingly Hispanic because of the agency’s location in West Dallas. Visit their website at www.TrinityRiverMission.org.